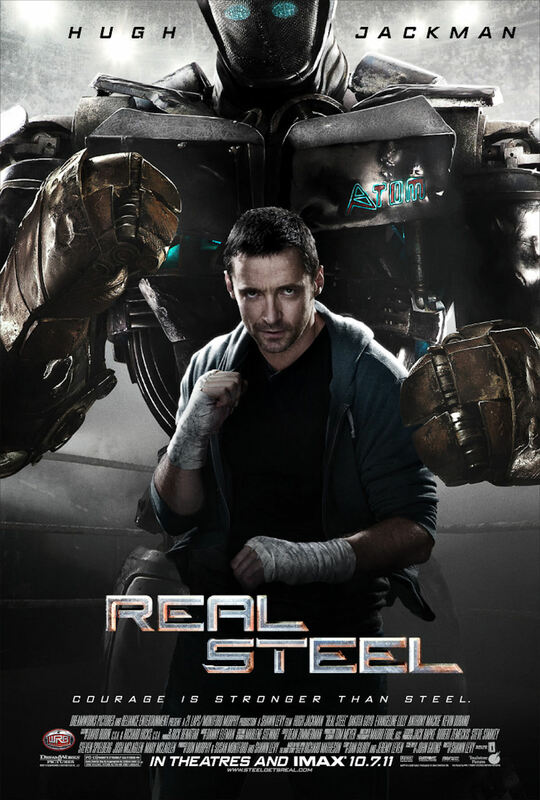 Starring Hugh Jackman in the lead, Real Steel is a flick based on a 1956 short story “Steel” by Richard Matheson. A boxing robot theme interspersed with human emotions seems to be an interesting concept. Does it bring the two together successfully? Lets see. At the outset we are told that Hugh Jackman who was a former boxer has huge debts on his head. To pay the loan sharks, he organizes robot boxing matches. But sadly ends up losing all the time, until one day…But then he is so enamored with his robots that he himself becomes one. Not bothered about his family and losing himself in the machines, he finally agrees to take custody of his son when told about his girlfriends death. The rest of the story deals with how the father and son partner together to conquer the robotic world. To some people the concept may bring the “Transformers” franchise to mind. But with its boxing robot competitions and complex interplay of human emotions, Real Steel is much more. In such a movie there’s always a danger of stuffing up the concept with action, animation, 3D effects and what not. But more than that, Shawn Levy – the director, has concentrated in showing the emotional bond grow between Hugh Jackman and his son, Dakota Goyo. The initial hesitation on Jackman’s part to take his son’s custody, the parts where he is about to become sentimental but doesn’t give in to finally where he fights his heart out in the battle against Zeus, Levy has done a brilliant job. The story moves at a pretty good pace throughout. The music of the movie has some interesting tracks from Limp Bizkit, Eminem, Foo Foo Fighters, Timbaland etc. included. Hugh Jackman has tremendous screen presence. His macho personality and an amazing physique look perfect for the character. You would surely believe him when he says that he learnt from Sylvester Stallone’s character in Rocky. Dakota Goyo as his son suits his character pretty well. Evangeline Lilly, the star of the series “Lost” who is Hugh Jackman’s girlfriend, doesn’t really have much of a role to talk about. The rest don’t get much scope. For Hugh Jackman and a beautiful way of merging human emotions with animation and the robotic world, I would say go for it!! And as said by one of my twitter followers @ThereToRegret – “the movie entertains, touches heart and has no non-sense”. Book Reviewing – An honourable activity or a commercial sham? oooh well that explains everything without any exaggeration. And evangeline, i thought she was lost *was a fan*:) nice one dude. Shud c ASAP. Yeah maan. Sadly Evangeline doesn’t seem to have anything much to do at all. What a waste of a role. It was rocking maan. Pretty good fights between the robots :).